When you choose to do business with Yuma Office Equipment you get much more than top quality copiers, faxes and digital imaging products, you get FAST, DEPENDABLE SERVICE! Our office administrative personnel are available to service your needs without delay. Looking for a business partner with integrity? Yuma Office Equipment is the right solution for your business. Now specializing in Computer Repair, Computer Networking and IT Services for Businesses in Yuma, AZ. 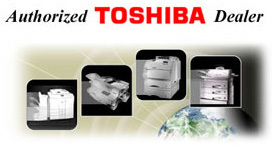 Only Authorized Toshiba Dealer with an office in Yuma, AZ. Yuma Office Equipment serve both Yuma and Imperial Counties! Authorized Lanier Dealer: Powerful Color and B&W Printing for Workgroup Environments. Whatever your workgroup demands from its document output system, Lanier's got a model that's right for you. The award-winning document systems from Sharp offer advanced features and innovative technology to help businesses maximize office productivity and streamline workflow. Plus, the Sharp multi-layer approach to securing documents and data protects your assets from vulnerability. The award-winning products, creative printing solutions and value-added services of OKI include one of the broadest lines of PC peripheral equipment in the industry. Our digital color printers, monochrome printers, all-in-one multifunction printers (MFPs), thermal label printers, point of sale (POS) printers, and dot matrix printers provide the best balance of value, cost and performance for your business.